Bali Melasti Tanah Lot Restaurant is located north of Tanah Lot Temple. 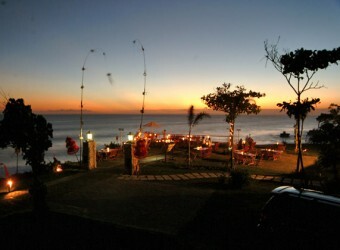 The restaurant which is built on a cliff facing the Indian Ocean offers fresh seafood with magnificent view of the sea. Kecak Dance Tanah Lot Temple performed daily on the stage near the restaurant. Melasti Kedonganan is the sister restaurant of Melasti Tanah Lot located in Jimbaran Beach.